Puebla Mexico intrigues me. Since I was first introduced to Spanish in Spain, I loved that country’s stamp on Puebla's history (Spaniards immigrated to Puebla to escape Spain’s Civil War in the 1930’s). Surprisingly, Puebla hasn’t yet attracted the attention of the typical expat…at least not American expat. It remains an enclave for many of Mexico City's wealthy, who keep second homes there. In spite of this idiosyncrasy, Poblanos defend their city vehemently as the best city in Mexico. 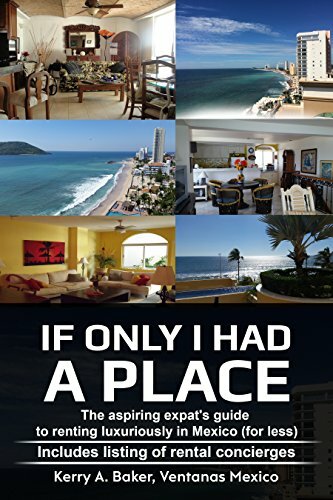 One such person is Cesár Dorantes Benitez, who represents Puebla as a rental concierge and is listed in "If Only I Had a Place," a guide to renting in Mexico. César works in student affairs at the Tecnologico de Monterrey, one one of most prestigious universities in Mexico. Married and with a daughter, he loves his role as a family man. He is bilingual from the 11 years spent in New York and Washington D.C. as an adult. Like everyone listed in my book, he's eager to share what he loves about his city. “Puebla is one of the most beautiful cities in the country, you can find everything here,” he said. "If you are interested in the traditional Mexico we have that: Nine of Mexico’s 100 “Pueblos Magicos” are in the state of Puebla. If you are interested in shopping, we have one of the best malls in the country, Angelopolis." The “Pueblo Magicos,” César refers to are places in Mexico selected for their symbolic attributes, historical significance, and legends. Each offers something fresh and interesting for national and international visitors. “Puebla boasts raised cobbled streets, brilliantly colored houses and unique cuisine. Another of its best features is that you don’t need to go far to disconnect and discover wonderful countryside," he said. If you were to live in Puebla, the item you would most likely buy as a gift for your American friends is Talavera pottery, which has been made here, uninterrupted, for four centuries and considered one of Mexico's most important symbols of artisanal art. Puebla also has a famous Safari Park. Although it's is Mexico's fourth largest city, Puebla has not yet attracted a large number of American expats in spite of its proximity to Mexico City, its celebrated cuisine and its abundance of shopping choices. I asked César if Puebla attracted expats from other countries. The moniker for a person from Puebla, "Pipope," was a term I had read was loved by some and hated by others. My Mexican friends roll their eyes and laughed knowingly when I mentioned the term. As an expat and amateur street sociologist, I couldn't help but ask César about it. "Wow! Right to the face!" he laughed. "But that's a good question! The word has a double meaning. It is used to make fun of Poblanos as haughty. The translation we like to give is “Pieza Poblana Perfecta,” or “a perfect piece of Poblana” (Unknown to César, this statement happens to be # 15 on the Matador Network article’s list of “25 Lies Every Poblano Has Told at Least Once In Their Lives.’ My Mazatlán friends filled me in on alternative meaning). Bu oh and the food in Puebla! Many regions, particularly Oaxaca, lay claim to the best cuisine in Mexico. What may give Puebla the edge is the number of schools of culinary arts based there. Many of its graduates decide to stay in town so it's not uncommon to find fabulous food in small, unknown eateries. Puebla is particularly well-known for its cemitas, a sandwich with a type of egg bread (Lie number #5 on the Matador list: "Will you share this cemita with me? I can't possibly finish it myself."). An ongoing debate for any poblano is who makes the best cemita in town. With his restaurant background, César warms up to the topic of food in Puebla. I asked him who he thought made the best cemitas. "Definitely one of the best cemitas in town is made in a local Street Market called “Mercado del Carmen," but this is only for real Poblanos. Tourists might not want to go to a street market. People who are not quite ready to mingle with the local market would be better off with the cemita franchise called La Atomica. They are pretty good with the local traditional flavors. Other dishes famous to the area are chiles en nogadas, mole poblano (considered by many as Mexico's national dish), and their antojitos (street food). The tastes of the regional dishes can vary widely because each chef has their special secret ingredients or touches. Something you can't miss if you happen to visit Puebla in the right season (and on the gastronomically adventurous side) is the traditional Molé de Caderas. “Mole de caderas y espinazo is a seasonal, regional dish from Tehuacan, Puebla that celebrates the region’s past. Every autumn since the 17th century, when Spanish settlers introduced livestock to Mexico, shepherds have driven goats from the coasts of Oaxaca and Guerrero to the Tehuacán Valley of Puebla. There they were sacrificed in a ritual ceremony before cooked for a feast. During the migration, the animals feed only on wild grasses and salt to retain liquids and don’t drink any water. As a result, the meat, unlike that of farm-raised animals, is very lean and flavorful. You will be very surprised at the wide variety of choices of international cuisine in Puebla as well as local specialties,” Cesár said. The local drink is the delicious, highly flammable La Pasita, of which there are 22 variations. La Pasita is named after the bar and was invented by Señor Emilio Contreras Aicardo. The lacquer, made from raisins and a number of other ingredients, depending on which version you prefer. It is normally served with a piece of cheese and some dried fruit. It appears to be one of those drinks everyone gets drunk on once, but only once, in their lives. When I looked at all the things that could go into a pasita, I found it a little frightening. I asked Cesar's advice as to what kind of caution should be taken and if he had a favorite. "You have certainly done your homework!" he said. "La Pasita is also a famous traditional place, although the locals don't visit it as much as tourists. The "Pasita" drink and where it's sold is is right across the street from the most famous flea market in Puebla, "Los Sapos," so you can take them both in on the same day." Apparently, you don't know Puebla if you don't know Leonel Estrada, known as Downtown's Bald Guy, or better in Spanish, 'el Pelón del Centro' or 'el Pelón del Zócalo', who recites odd poems to visitors for a living. Calling himself both poet and urban artist, he's gained celebrity on social platforms and YouTube. I have read that Poblanos have a pronounced accent that even expats have been known to pick up. Would there any hope for me in loosing my American accent when I spoke Spanish, I asked? “Yes,” he said, “Many people from all over the country make a joke about our pronounced accent. As an old city, Puebla has its legends, the most famous being the Legend of the Two Brothers. Two brothers, inseparable and loved, the sons of a hostler of the governor, disappeared one day after leaving for school and were never found. A fountain was erected in their honor and people say they still hear the noises of playing and children's laughter near the fountain. I asked César about his favorite legend. “The view that adorns one of the world’s largest cities, and Puebla’s as well, is enhanced by the majesty of two of the highest volcanoes in the hemisphere: Popocatépetl and Iztaccíhuatl, which has its own legend." The presence of these enormous millennial volcanoes has been of great significance for the different societies that have admired and revered them, being a source of inspiration for the many legends about their origin and creation. Thousands of years ago, when the Aztec Empire was in its heyday and dominated the Valley of Mexico, it was common practice to subject neighboring towns, and to require a mandatory tax. It was then that the chief of the Tlaxcaltecas, bitter enemies of the Aztecs, weary of this terrible oppression, decided to fight for his people’s freedom. The chief had a daughter named Iztaccihuatl: the most beautiful of all the princesses, who had professed her love for young Popocatepetl, one of her father’s people and the most handsome warrior. Both professed a deep love for each other, so before leaving for war, Popocatepetl asked the chief for the hand of Princess Iztaccihuatl. The father gladly agreed and promised to welcome him back with a big celebration to give him his daughter’s hand if he returned victorious from the battle. The brave warrior accepted, prepared everything and departed keeping in his heart the promise that the princess would be waiting for him to consummate their love. Soon afterward, a love rival of Popocatepetl, jealous of the love they professed to each other, told Princess Iztaccihuatl that her beloved had died in combat. Crushed by such tragedy and overwhelmed by sadness, the princess died, without even imagining it could be a lie. Popocatepetl returned victorious to his people, hoping to find his beloved princess. Upon arrival, he received the terrible news of the death of Iztaccihuatl. Devastated by the news, he wandered about the streets for several days and nights, until he decided he had to do something to honor her love and to assure that the princess would not ever be forgotten. He ordered a great tomb built under the sun, piling up ten hills together to form a huge mountain.He carried the dead Princess in his arms, took her to the summit and laid her on the great mountain. The young warrior lovingly kissed her cold lips, took a smoking torch and knelt in front of his beloved to watch over her eternal sleep. From then on, they continue together, facing each other. Eventually, the snow covered their bodies, forming two majestic volcanoes that would remain joined until the end of time. The legend goes on to say that when the warrior Popocatepetl remembers his beloved, his heart – that preserves the fire of eternal passion – shakes and his torch smokes. That’s why to this day, the Popocatepetl volcano continues spewing fumaroles. “Even today whenever I remember this legend in full detail… I can´t help but feel a bit overwhelmed by it,” noted César. For more pictures of Puebla, check out Ventanas Mexico Pinterest page. Next up: Argentine therapist uses parables in his books as tools for reflection and healing. Most recent: Be prepareed: Mexicans still like to “drop by." Hola! I'm a partner with Ventanas Mexico and author of the "Interactive Guide to Learning Spanish Free Online" a curation of the best free tools on the web to help you learn Spanish so you can surf the web in two languages (like I did for this article). The Guide takes you to all the best free language sites and features via links so you use it with your laptop, e-reader or tablet. I love my Acer Aspire for studying and travel. It's thin, lightweight and elegant, and perfect for travel.